For reservations call between 9am-9pm MST or reserve securely online. 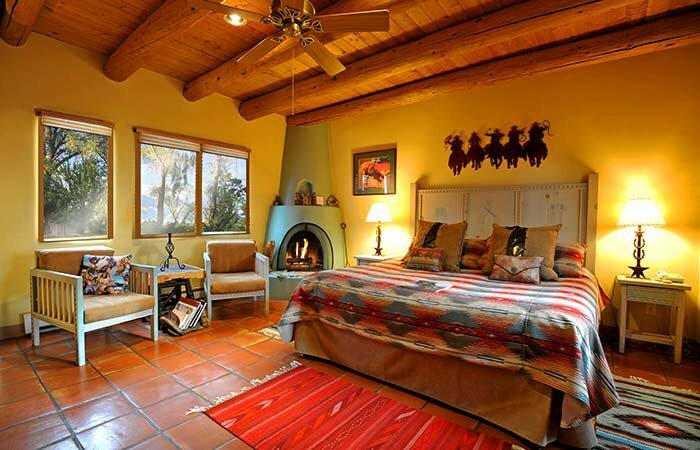 Driving directions on how to get to Hacienda del Sol Bed and Breakfast Inn, Taos New Mexico, from different locations. Important. Do not rely on Apple Maps on your iphone, please use the directions below. Travel I-25 north toward Santa Fe. Take Exit 276B and merge onto Highway 599 which is the Santa Fe Bypass. Take the Espanola/Taos exit and travel north on Highway 285/84. In Espanola, the road you are on becomes Highway 68 North (North Riverside Dr). Follow Highway 68 to Taos. In Taos, Highway 68 becomes Highway 64 (Paseo del Pueblo Norte), the main road through town. Proceed through town - past the Plaza - for another mile. You'll pass Allsup's Phillips66 gas station on the right. Slow down when you see the Cid's Gourmet Market on the right. Directly ahead - also on the right - just passed the white wall of the Love Apple Restaurant, you'll see our tan and turquoise sign. Turn right just prior to the sign and follow the gravel lane 150 feet where you'll see the entrance and parking lot to the Hacienda del Sol on the left. Estimated Time: 2 1/2 hours. AVOID AFTERNOON TRAFFIC IN TAOS, TAKE ALTERNATE ROUTE FROM SANTA FE AND ALBUQUERQUE! Upon arrival into Taos on 68 take a left on PASEO DEL CANON EAST, then a right at the stop sign onto SALAZAR ROAD until it ends. Take a right on RANCHITOS ROAD. At the stoplight take a left onto CAMINO DE LAS PLACITA. Follow it to the end then at the stoplight take a left onto 64 WEST (PASEO DEL PUEBLO NORTE). We are about 0.2 miles down on the right hand side after the Love Apple Restaurant Sign. Take Highway 160 to Highway US-84 East. 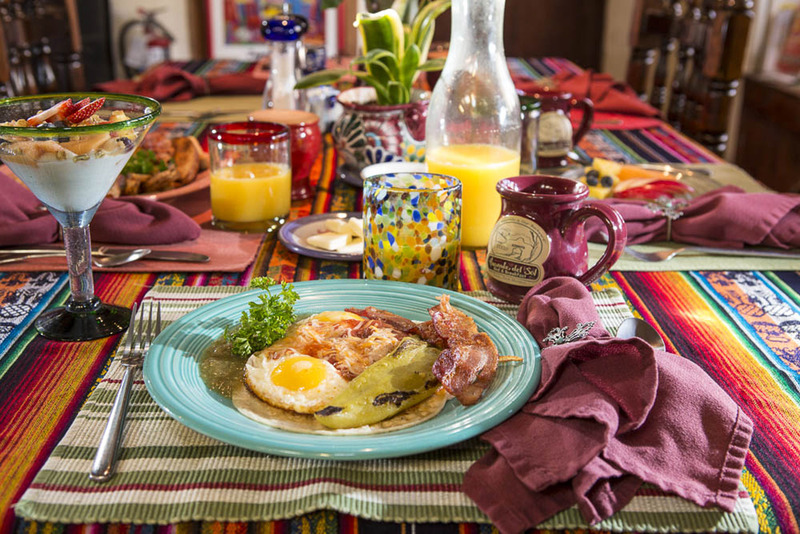 At Tierra Amarilla, go east on Highway 64. About three miles north of Taos, at the intersection of Highways 64, 522 and 150, turn right on Highway 64. Highway 64 becomes Paseo del Pueblo Norte, the main road through Taos. Proceed 3 miles south. Slow down when you see Pinch Penny Wash-o-Mat on the left. Directly opposite the carwash on the right is our tan and turquoise sign, Hacienda del Sol. Turn left directly after the sign onto Mabel Dodge Lane. We are 150 feet down the road on the left. Estimated Time: 4 3/4 hours. Travel I-25 South across the New Mexico border. About 5 miles south of Raton, take Exit 446 (US-64) toward Taos and Cimarron. Follow US-64 to Taos. Turn right at the intersection of US-64 and Paseo del Pueblo Norte, the main road through Taos. Proceed through town past the Plaza and Allsup's Phillips66 gas station on the right. Slow down when you see the Laughing Horse Inn on the right. Directly ahead - also on the right - you'll see our tan and turquoise sign. Turn right just prior to the sign and follow the gravel lane 150 feet where you'll see the entrance and parking lot to the Hacienda del Sol on the left. Estimated Time: 5 1/2 hours. Travel I-25 South to the Walsenburg exit (US-160) south of Pueblo. Follow US-160 to the Fort Garland/Highway 159 junction. Turn left and follow Highway 159 across the New Mexican border where the highway becomes New Mexico Highway 522. Stay on Highway 522 until the junction of Highways 522, 64 and 150 three miles north of Taos. Continue through the lights. Highway 522 becomes US-64 which becomes Paseo del Pueblo Norte, the main road through Taos. Slow down when you see Pinch Penny Wash-o-Mat on the left. Directly opposite the carwash on the right is our tan and turquoise sign, Hacienda del Sol. Turn left directly after the sign onto Mabel Dodge Lane. We are 150 feet down the road on the left.